Text Pendulum Effect: You can reduce the battle damage you take from an attack involving a Pendulum Monster you control to 0. During your End Phase: You can destroy this card, and if you do, add 1 Pendulum Monster with 1500 or less ATK from your Deck to your hand. 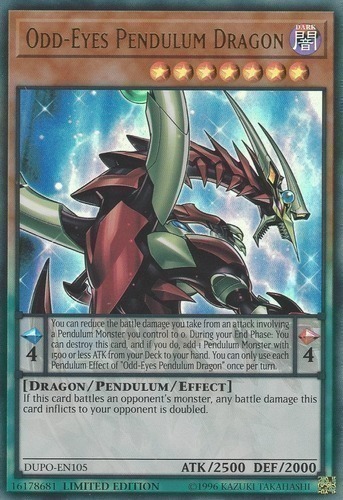 You can only use each Pendulum Effect of "Odd-Eyes Pendulum Dragon" once per turn. Monster Effect: If this card battles an opponent's monster, any battle damage this card inflicts to your opponent is doubled.